COLUMBUS, Ohio — The newly renegotiated trade agreement involving the United States, Canada and Mexico offers farmers a bit more security about markets for dairy, corn and other products, but hefty Mexican tariffs still in place hinder business, according to an agricultural trade specialist with The Ohio State University. Under the new trade agreement, dairy farmers in the United States will have 3.75 percent more access to the Canadian dairy market. That means they’ll be able to sell more of their cheese, milk and other products there without those products getting taxed heavily at the Canadian border. “Dairy farmers in Ohio should be happy,” said Ian Sheldon, an agricultural economist who serves as the Andersons Chair in Agricultural Marketing, Trade and Policy in the College of Food, Agricultural, and Environmental Sciences (CFAES). The agreement also reassures corn growers, who may have worried about not being able to sell to Mexico, a significant importer of U.S. corn and corn products, Sheldon said. “This has reduced some uncertainty for farmers that they’re not going to lose the markets they’ve had under NAFTA,” he said, referring to the North American Free Trade Agreement that went into effect in 1994. The price that corn is traded at has gone up in response to the announcement of the new United States-Mexico-Canada agreement reached on Sept. 30, which replaces NAFTA. But trade barriers still exist — even in Mexico. 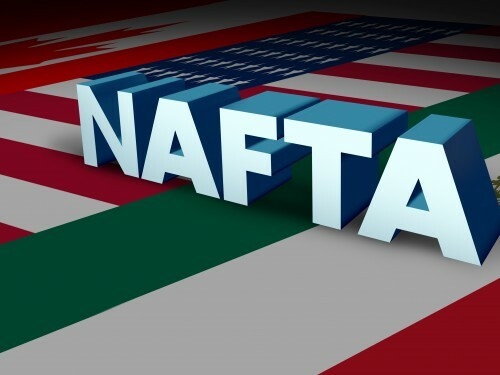 After the Trump administration imposed a 25 percent tariff on foreign steel and 10 percent on foreign aluminum purchases in the United States on May 31, Mexico, among other countries, quickly retaliated with hefty tariffs on imported U.S. products. Mexico imposed tariffs, now up to 25 percent, on U.S. cheese, pork, apples and a number of other products, and those tariffs, along with the U.S. steel and aluminum tariffs, remain despite the new trade agreement. Until Mexico removes those retaliatory tariffs, “the benefits of the dairy provisions in the new trade agreement won’t be fully realized,” said Ben Brown, manager of the farm management program in CFAES. As for corn and soybeans, “we already had free trade under the original NAFTA agreement, so the new agreement gets us back to where we were,” said Brown, who along with Sheldon works in the Department of Agricultural, Environmental, and Development Economics within CFAES. The biggest blow for Ohio farmers has been the soybean tariffs imposed by China, the world’s largest consumer of soybeans. Soybeans are Ohio’s top agricultural export, with exports totaling $1.8 billion last year. China imposed tariffs on U.S. soybeans in response to the tariffs imposed on its aluminum and steel products in the United States. The tariffs on U.S. soybeans in China continue to block access to the Chinese market and bring down soybean prices.